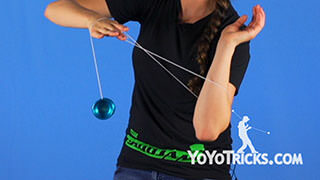 How to perform the YoYo Trick Nitrogen Cycle by Tessa Piccillo. 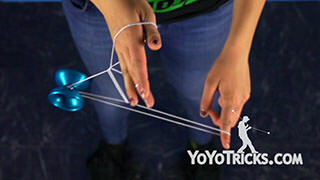 Nitrogen Cycle Yoyo TrickThis trick is called Nitrogen Cycle and it looks like this. 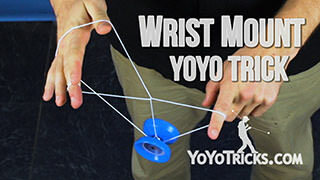 So to start this trick, hook the string on your opposite index and then bring your throw hand thumb in and wrap it around the string from the top and into it like that. 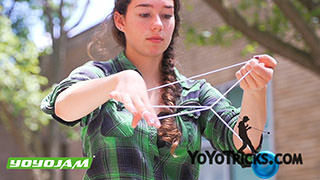 Then you are going to cross your arms and bring the yoyo up and land on this string in between your fingers, like that. 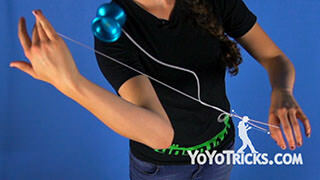 Then from here you are going to uncross your arms and bring this string behind the yoyo like that. Then hook your thumb under on the same string and swing the yoyo over your throw hand so those strings lay across it like that. Then from here you are going to push the yoyo out and reject it and land on the string in between your thumbs going over this string on top, like that. So to much the rejection easier you are going to bring your hands together as you reject it and then pull them back apart to land it on the string. So from here bring the yoyo over your throw hand and hit this string so then the string lay over your throw hand like that. Bring your hand in this loop here so you are in a Wrist Mount. Then land on this string, double on, then come back out of it, then do an underpass, hit that top string and come back out. So as you can see all these steps are pretty easy it is just about doing it fast. 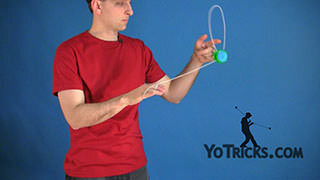 So from here you are going to hit the top and cross your arms so the yoyo lands behind your throw arm. 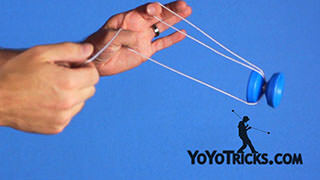 Then you are going to pass the yoyo over your non throw hand index and land on that string. Then do the same motion that you did earlier and then to get out of this you are going to turn turn your wrist so you untwist these strings here, hit the top string again and let go with your non throw hand so it will look like that. Then land back into a Wrist Mount. 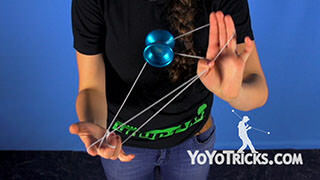 So from here you are going to hit this top string and roll the yoyo over your throwhand but when you do that grab this string with all your fingers like that. Then you are going to pass the yoyo over the top of this string here, then unroll your index finger curl it in then bring it back out. Now from here you are going to roll the yoyo over your throwhand and miss this string in front here. Open up this loop with your thumb pull back and then from the back you are going to roll the yoyo onto this front string here. To finish the trick, you are going to throw the suicide catch it and as you do that, let go of this loop with your throw hand. You are in a Trapeze, dismount and that is Nitrogen Cycle.